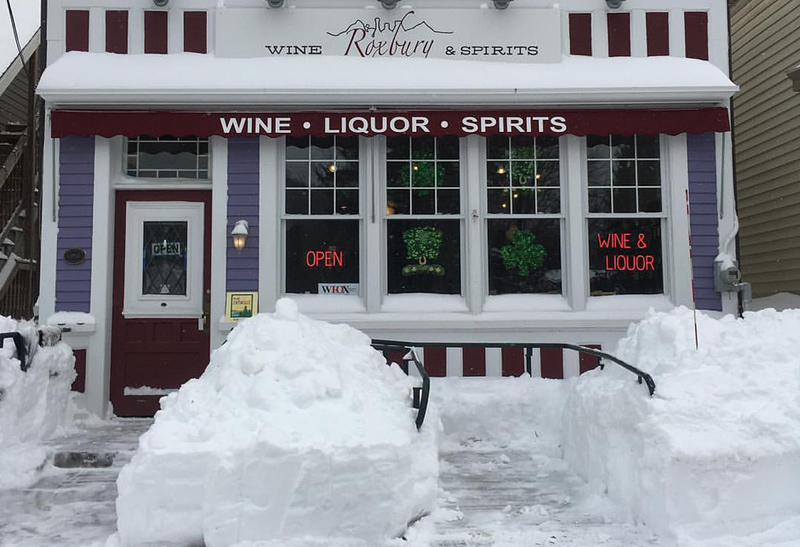 Digging out at Roxbury Wine & Spirits. Photo courtesy of the store. The ski resorts are celebrating nearly three feet of fresh powder while the farmers are working overtime, plowing through drifts to feed and house their animals. Many roads and businesses remain closed. So how much snow did the Catskills really get in yesterday’s nor’easter? Well, that depends on what you were drinking. Across Facebook and Instagram, beverage makers and retailers applied a variety of measuring tools. In Schoharie County, it was four bottles deep, according to the folks at 1857 Spirits, who distill vodka from potatoes grown at Barber’s Farm, a sixth-generation family operation just south of Middleburgh. Four bottles deep was the diagnosis at 1857 Spirits in Schoharie County. Photo via the distillery’s Facebook page. In Roxbury, it was plenty deep enough to chill a bottle of prosecco long before it even stopped falling, Roxbury Wine & Spirits proprietor Jeff Tichenor demonstrated. West Kill Brewing co-brewer Patrick Allen measured with Founder’s All Day IPA, since West Kill’s own beers are still a few weeks away. The bartenders at Tannersville’s Deer Mountain Inn also indulged in a little snow-day pun. I mean, fun. How much longer until the return of outdoor dining? If the deck at The Laundrette in Narrowsburg is any indication, it’s going to be a little while. Want more Catskill Eats? Please join us on Facebook, Twitter and Instagram for breaking news and more photos. Tag us at #CatskillEats if you’d like to share a photo for features like this one. Got a tip to offer? Drop us a line here.